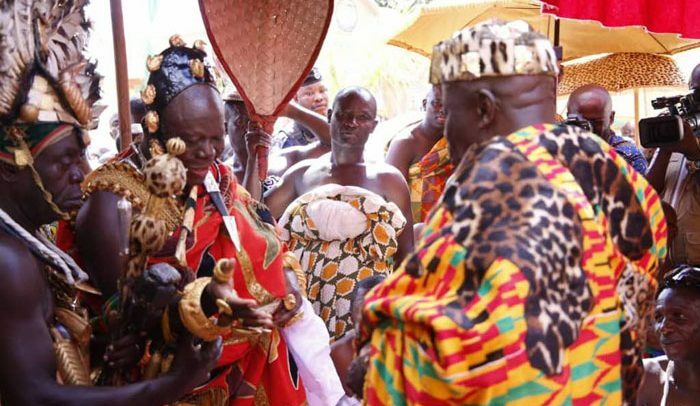 The visit by the Otumfuo Osei Tutu II, the Asantehene to his Akyem counterpart, Osagyefuo Amoatia Ofori-Panin, last Thursday put paid to the so-called schism between the Akyems and Ashantis. The occasion amidst the accompanying of pomp and pageantry showed how our traditional authorities understand local diplomacy and the means of deepening bonds of friendship which are steeped in history. In pre-colonial days and even when the whites arrived, our traditional rulers addressed local challenges which sometimes erupted in the relationships with their neighbours even though sometimes wars broke out. Local diplomacy which featured prominently during the engagement between the two great kings is part of our chieftaincy institution in the country and can only be preserved during such displays as witnessed in Kyebi. We doff our hats for the initiatives of the two great Kings of Ashanti and Akyem; the two tracing their origins to Adansi in the face of a perceived rivalry. We are aware about how some politicians feasted on what they considered an inter-ethnic rivalry. Amazingly, they invested in it in pursuance of their selfish political ends. The national security implication of their project was costly and we are glad that whatever has been their achievement in this regard, same has flown out through the window hopefully never to return to muddy the waters as it did. The results are multifaceted. Other traditional authorities can emulate the example set by these two kings to settle their differences if there are such challenges in their relationships. When perception is especially blown out of proportion, the template presented by the two Kings comes in handy and effective. Such occasional pomp and pageantry is necessary as it rekindles the spirit of our heritage which without doubt is being threatened by the devouring and powerful foreign media to which we are exposed all year-long. We urge the Chieftaincy and Culture Ministry to explore means of displaying such cultures by contacting the relevant traditional rulers so these can be factored into a national culture calendar. When it comes to those who have stood their grounds against foreign cultural invasion, the Akans stand out prominently. Imagine the historical narratives flowing from the lips of the Ashanti King. That the Asantehene was clad in a cloth used by his forebear, Nana Prempeh I, some 83 years ago during the restoration of the Asante confederacy is evidential of how history plays a crucial role in our chieftaincy institution. What unfolded last Thursday should be emulated by other traditional rulers across the country because besides the display of our culture and therefore preserving our rich heritage, it shows that local diplomacy must be encouraged among our chiefs. Those who think that our chieftaincy institution has no relevance in contemporary Ghana and the world at large must have a rethink. Our chieftaincy institution is as relevant today as it was yesterday. The institution, somewhat neglected and hardly consulted in matters of national development and even social crisis which sometimes plaques the nation, must be made more use of than the largely ceremonial role it plays. Their local influence can, for instance, be harnessed for the anti-galamsey war among other challenges confronting us as a nation.